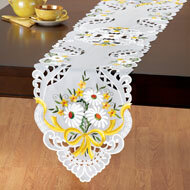 Solid Scroll Scalloped Edge Tablecloth from Collections Etc. 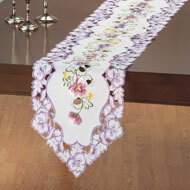 This versatile tablecloth features an elegant tone-on-tone scroll pattern and a pretty scalloped edge. Available in your choice of red, forest green, blue, sage green, burnt orange or white, it's the perfect way to dress your table this season. Select round or rectangle. Machine wash. Polyester. Imported. Colors available in Burnt Orange, White, Red, Forest Green, Sage Green, or Blue. Sizes available in either Round (70"Dia), or Rectangle (60" x 90"). I have this tablecloth on my dining room table. It's all decorated for the Harvest. Festive placements, dishes, and a luminated gourd complete the look. I love it.  - Katy55, Pittsburgh,Pa. I ordered this as a last minute replacement for my table and wasn't expecting too much. Wow, when it came, I couldn't believe the quality! Washes great and doesn't shrink! Great purchase! - Sadie, Hanover Township Pa.
Would purchase other colors in the future. Can't find this in stores. Nice choice of colors and sizes. Probably also buy one for Christmas. - BB, West Bend Wi. Really makes you holiday table stand out. 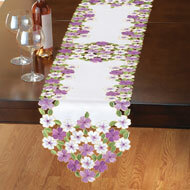 I can't say enough about how beautiful this table cloth is at fair price. I love the swirl detain as well as the scalloped edge which makes it look like a high end tablecloth which you spent a ton of money for. I may go back and buy another one to make my kitchen décor colors later on. I love this tablecloth and would highly recommend it to any one. Mine was back ordered at the time I purchased it and had a chance of not making it here before Christmas but it came in in plenty of time to get my holiday table all dressed up so pretty. - Neme, Poplar Bluff, Mo. I would love to buy this product again. My wife ordered 4 of these tablecloths.....2 in white and 2 in orange. She has ordered them before too! - Rebel1947, Cape Coral, Fl. Such a pretty vibrant color. Love it. Pretty color. 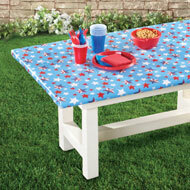 Will use for Memorial Day, July 4th and Labor Day table scapes. - Victorian Rose, Eldersburg, Md. BEAUTIFUL FALL COLOR AND GREAT MATERIAL. - DEMELO, WAREHAM,MA. Fits my table perfectly. Very nice.. - jmax15, Nice, CA.